When player equips Equipment, all stats are greatly increased. Enhance and Refine Equipment for greater boost effect. 【Function Access】Click “Equipment” in the bottom right corner of the Main Panel. 【Requirement】Can gain Fashion by clearing Story and participating in Events. ·Player has option to Enhance 5 times or once，each Enhance has chance to crit, increasing Enhance Level. ·When 4 equipment reach Enhance level 10, Enhancement Chain is activated.1 rank is gained every 10 levels. Enhancement Chain can increase character stats. ·Higher level Enhancement Chain is activated when 4 Equipment reach required level. ·Level cap of Equipment Enhance is determined by character level. ·Equipment Refine costs Refine Stone, player need to select Refine Stone quality first. ·Hold down Refine to continuously Refine. ·Select“1 Click Refine”，to automatically add Refine Stones until the next level is reached. ·When 4 equipment reach Refine level 10, Refine Chain is activated. Granting Hero damage or damage reduction buff. ·Higher level Refine Chain is activated when 4 Equipment reach required level. 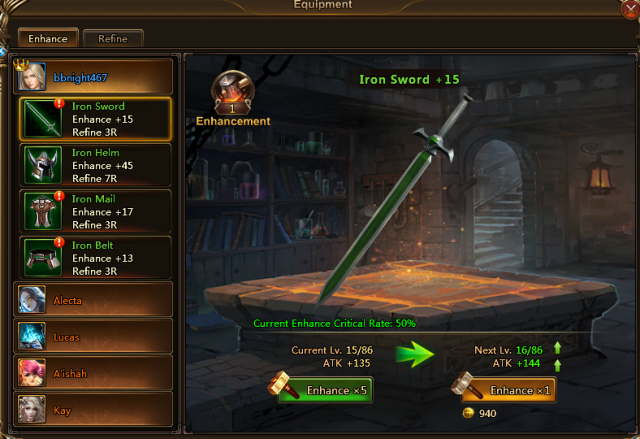 Players can increase Equipment effect by Enchanting Equipment. Each time player Enchants, Equipment gains mysterious stats.